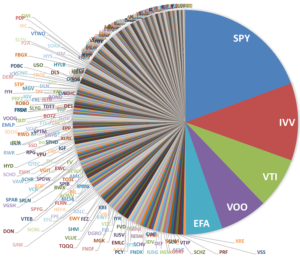 Earlier this year, I put nearly 20 of my favorite ETF-related charts in a single spot. Images are often more powerful than words. Based on the response I received, I decided to compile some new favorites, all of which I’ve come across over the past several months. Enjoy! 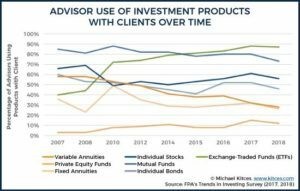 One of the drivers of ETF growth has been financial advisors, who are using low cost ETFs to implement portfolio strategies. 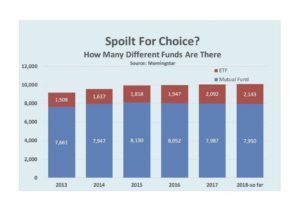 Institutional investors, including investment advisors, are a growing share of the overall ETF market. 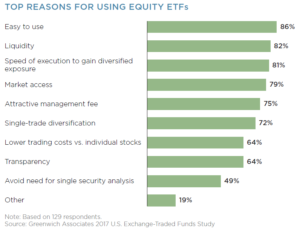 Why are Institutional Investors Increasingly Using ETFs? 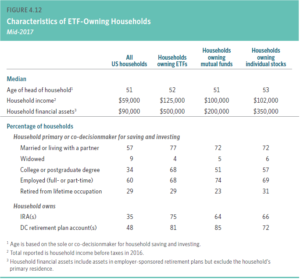 Households owning ETFs tend to have higher incomes, greater financial assets, and more education than households owning mutual funds or individual stocks. 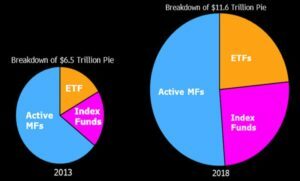 Stock ETFs and index funds now represent nearly 50% of assets. While losing market share, active mutual funds have actually benefited from a growing total pie – one fueled by a bull market. 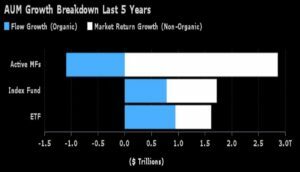 That active mutual fund growth has been driven solely by market returns, not new investor money. 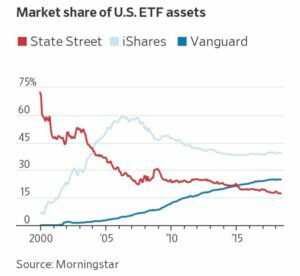 But if history is any guide, another sharp stock selloff will likely only further fuel the rise of ETFs and create real headaches for active mutual funds. Why Might a Bear Market Cause Headaches for Mutual Funds? Fees. 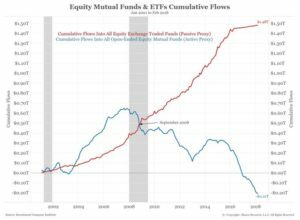 A falling stock market would provide an opportunity for investors with current taxable gains to sell expensive mutual funds and move to lower cost, passive ETFs. 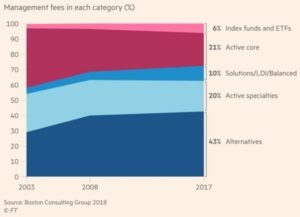 But ETFs represent just 3% of total industry fees paid by investors. 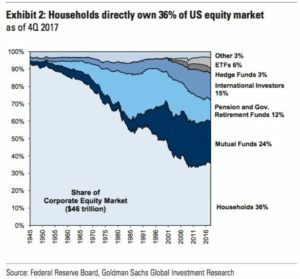 All passive funds represent only 6%. 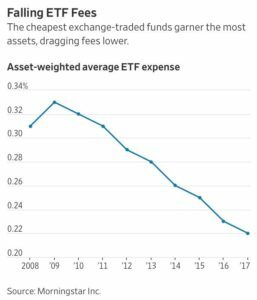 A single mutual fund company, Fidelity, generates more than twice the revenue of the entire ETF industry! 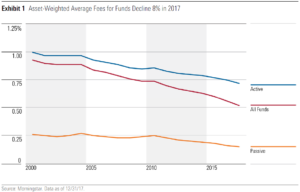 Competition continues to drive down ETF costs. 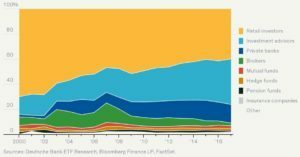 The ETF industry is top heavy, with the three largest providers accounting for 80%+ market share – which has evolved over time. The largest providers have the largest ETFs. I created a Michael Batnik-esque chart showing the AUM of the top 5 ETFs = $688,731,065,734, while the AUM of ETFs #125 – 500 = $690,591,535,066. The AUM of the bottom 2,034 ETFs = $687,952,849,033. Worries that ETFs are driving the stock market are clearly overblown. 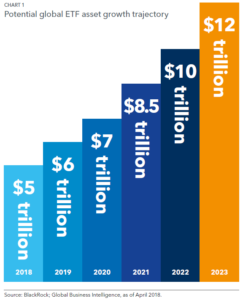 iShares believes global ETF assets could reach $12 trillion over five years. 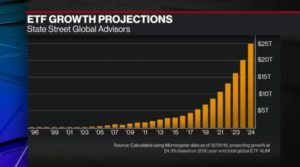 State Street believes global ETF assets could hit $25 trillion by 2025.